Is it profitable to add weight and sell heavier feeder calves this year? Last spring I wrote an article entitled “At What Weight should I sell my Feeder Calves” that bought forth many questions on the value of each additional pound of gain. This article will serve as a follow-up to revisit the value of gain, and share the calculation for producers to use to evaluate their individual situation. The feeder calves with the greatest value are almost always the heavier calves. The question that producers must answer for themselves is “Will it be profitable to add the additional weight and sell heavier feeder calves?” They can accomplish this by calculating the value of gain of their feeder calves. For cow-calf producers, value of gain (VOG) is the net dollar value after the price slide of light to heavy feeder calves has been calculated. Calculating value of gain assists producers in looking ahead at potential marketing opportunities and allows them to carefully evaluate their production plans. However, it ultimately helps producers determine the optimal weight to market their feeder calves. To calculate the value of gain, the total dollar value per head in the beginning is subtracted from the total dollar value per head at the end. The net dollar value per head is then divided by the pounds of gain per head to determine the value of gain per pound. Below is an example of how producers can calculate value of gain (VOG). The prices used for this analysis were for 425-pound and 575-pound Feeder Steer Calves (Medium and Large Frame, #1 Muscle Score) from the USDA Florida Cattle Auctions Weekly Summary for the week ending April 13th, 2018. Producers should consider taking the time to calculate their expected value of gain to help decide the optimal weight to sell their feeder calves. It’s important for producers to know their value of gain, because to make money, the value of gain needs to be greater than the cost of gain. Once a producer has calculated their value of gain, they must evaluate whether or not they can increase their returns by adding additional weight to their feeder calves. In the example above, a producer would need to add the 150 pounds per feeder steer for less than $126/head or $0.84/pound to add profit to their operation. There are many methods to add weight to feeder calves that vary considerably. Producers must analyze their individual situation to determine if the value of the additional pounds will be greater than the cost of gain. Additionally, please note that the price of the calf sold ($1.55/lb.) is more than the value of gain per pound ($0.84/lb.) in the example above. It’s important to understand that their feeder calf value of gain is not the same as the market price received, due to the price slide associated with marketing heavier animals. 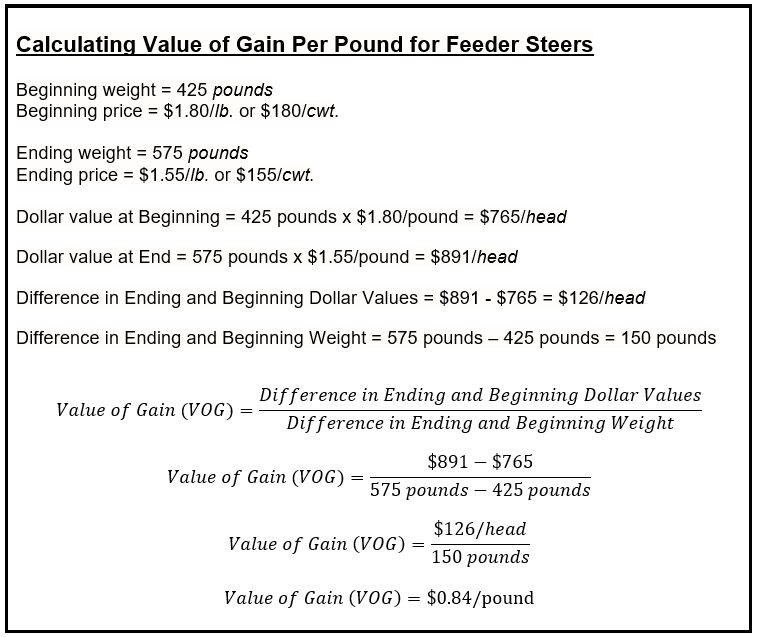 The only time that the value of gain per pound would be equal to the market price per pound is when there is no difference in price per pound between different weights of feeder calves. Feeder calf value of gain is a sensitive variable and can change frequently as changes in fundamental supply and demand variables influence the beef cattle market. For example, value of gain can vary greatly from weight class to weight class making it very important to calculate the value of gain of all weight classes, before adding additional weight to your feeder calves. Therefore, producers should evaluate value of gain regularly as they prepare to market their feeder calves in 2018 to be more profitable.